When Craig visited Dadaab, Kenya, four years ago and met Ali, he witnessed hundreds of families lined along the road to the world's largest refugee camp. Most weren't fleeing violence, they were fleeing the weather. As climate change advances, disasters like the drought that ravaged East Africa in 2011 are becoming more frequent and severe. Ali Noor Gedi was so malnourished, the three-year-old was scarcely bigger than the average Canadian infant. Ali's mother let Craig stroke his cheek gently while nurses tried unsuccessfully to find a vein big enough to insert an IV in his twig-thin arm. When Craig visited Dadaab, Kenya, four years ago and met Ali, he witnessed hundreds of families lined along the road to the world's largest refugee camp. Most weren't fleeing violence, they were fleeing the weather. 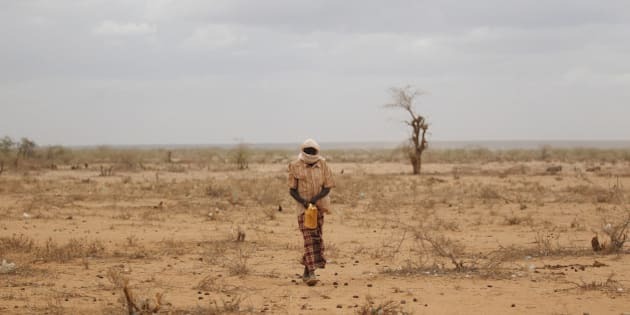 As climate change advances, disasters like the drought that ravaged East Africa in 2011 are becoming more frequent and severe. A newly-released report from the World Bank says that 100 million more people could be thrown into poverty in the next 15 years as a direct consequence of increasingly erratic climate patterns. Since the United Nations Climate Change Conference (COP 21) began in Paris on November 30, the Government of Canada has announced $2.65 billion over five years to help developing countries adapt, and that our country will support a lower 1.5 degree limit on global warming. Pundits say these moves show "Canada is back" when it comes to action on climate change. But they've missed the bigger story. What's really thrilling is that Canada appears to be changing sides in one of the oldest dynamics of international environmental politics: the gaping chasm between rich and poor countries, which has stymied climate talks for two decades. "The old entrenched north-south politics is very damaging," agrees Steven Bernstein, a professor of political science at the University of Toronto who has followed global climate talks since he attended the very first UN COP meeting in 1995. Having seen the impact of climate change in places like Dadaab, we spoke with Bernstein about the critical issues for developing nations this past week in Paris. The world consensus has been that, to prevent the worst effects of climate change, global temperature increases must not exceed two degrees above the pre-industrial age (roughly before 1850) average temperature. But for small island nations like Tuvalu in the South Pacific, even a two-degree change could see their homes disappear under a rising sea within the next few decades. These countries want a lower goal of just 1.5 degrees. That would mean even steeper emissions cuts for rich industrial countries, which is why Canada's newfound support for the idea is so incredible. It's not enough to simply pay for damages. Another key wish among vulnerable nations is a legally binding agreement on loss and damages -- essentially a global insurance plan for countries hurt by climate change. The developing world wants a solid commitment now to compensate for the harm their people will inevitably face when crops whither and livestock die. As we write this, Canada has yet to take a position on loss and damages, but our government's actions thus far give us cause for optimism. It's not enough to simply pay for damages. We must help developing countries adapt to climate change, and build sustainable economies. Countries like Bangladesh and Tanzania have contributed little to the problem of global warming. But if they are to avoid becoming greenhouse gas emitters, they must bypass establishing carbon-intensive industries, such as fossil fuel-based power generation, jumping directly to 21st century green technologies. That will take massive funding from rich nations. Overall, the world has committed $100 billion to adaptation, although Bernstein agrees that is vastly inadequate. Nevertheless, although there are no details yet on how the money will be used, Bernstein says Canada is making a "significant" investment in helping developing countries adapt to climate change. As we write, the Paris conference is still underway. So far, Canada has shown tremendous leadership. We hope that, when COP21 ends on December 11, our country will have gone even further, and other developed countries will have followed our example, setting aside our own economic self-interest for the sake of those who will suffer from a problem we largely created. The actions of the first world that will determine whether families like Ali's will starve when unprecedented storms destroy crops and livelihoods. Brothers Craig and Marc Kielburger founded a platform for social change that includes the international charity, Free The Children, the social enterprise, Me to We, and the youth empowerment movement, We Day. Visit we.org for more information.